Proud Canadian moment – Oh Canada! Holy crap am I proud to be a Canadian after reading this article! The morning I read it started like any other – I stumbled out of bed to the blaring alarm clock that my oh-so-loving fiancé Cody had set for me the night before, then a clumsy and dreary walk back to the bed where I retreated under the warm covers. I grabbed my two pups to cuddle with for a little while longer – I find it a hell of a lot harder to get out of bed when it’s -10000 outside (yes I am being dramatic!). Then a lean for the remote, which lives across our bed on Cody’s side. Cody is remote king in our house, because apparently my taste in television is not up to his standards. (This coming from a man who thinks poop jokes are HILARIOUS). Normally in the morning I watch Breakfast Television, or even the TODAY Show if I am feeling sassy, but today I was in the mood for some good ol’ Olympic games. I changed the channel to CBC and watched the finals of the Men’s Cross Country Skiing match. Whenever I see these athletes from all over the world, I am in awe. Their dedication, their drive, their determination – it’s exhausting just thinking about it! Hmm no Canadians in the mix … disappointing, but I am still gonna watch! Seriously how long do they have to wait, press the trigger man!! I watched as they glided through the snow, one after another…. Oh my, their legs, I would like to have their legs…less hairy CLEARLY, but still – add some heels to some of them, and hot damn you got some fine-looking legs! They are up the hill! Aren’t skiers supposed to be going down hill? Then it happened: I watched as the Russian athlete Anton Gafarov fell, and fell hard! The camera quickly panned to the other athletes who were still racing away. Clearly whoever was going to win is more interesting than Gafarov, who the announcer is saying is out of the competition. The gap between him and the others was growing wider and wider! They showed the winning Olympian, arms in the air, embracing his coach – they did it! Then the camera panned back to Gafarov who was coming from behind and dragging his broken ski with him. You could tell his spirits were broken, and he was in pain, but he we was determined to cross that finish line. Kudos to him – I would have lay there and given up until someone came and dragged me away, or bribed me with a cookie. I went to work and completely forgot about the incident that I had watched; it didn’t really affect my day-to-day. Canada had already been eliminated, so I wasn’t cheering for anyone particular. That is until I came across the article The Star had posted about coach Justin Wadsworth for the Canadian Cross Country Skiing Team. After watching all of his team be defeated earlier in the competition, he stopped and helped the fallen Olympian. The article reads that he was watching Gafarov with other coaches from all over the world including Russia! What really made this story scream Canada, and what I find is the highlight of the article, is when the reporter asked to speak with Wadsworth, he was confused as to why they were even bothering to interview him. He didn’t win and his team didn’t even come close – they were eliminated in the first round! When the reporter asked him about helping the fallen athlete, the coach was surprised. 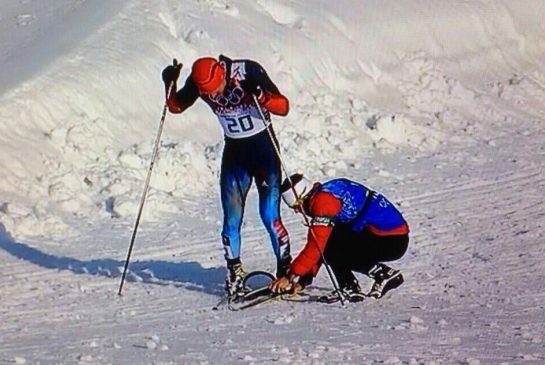 It was just second nature for him to help out a fellow man, regardless of competition, or country. He didn’t seem to think it was newsworthy. This amazes me, and brings a little tickle to the back of my throat. Of course he didn’t think it was worth the reporter’s time! I am proud to know we have a true Canadian over in Russia representing us, not only coaching our athletes through their good times and bad, but helping out those who need it, regardless of their nationality. You, Justin Wadsworth, are a real Canadian Olympian. AMAZING!! Yup proud to be Canadian RIGHT HERE! Can I share this on my twitter feed? Sure! 🙂 Thank you so much! One of my favourite posts, so far.